Fast forward a year. I’d had a story appear in Tu Books’ Diverse Energies anthology of YA dystopian fiction. And, because of that, I got forwarded an email where Tu called for submissions to their first contest: they actually wanted novels about people of color. I had this YA novel, which still hadn’t really been marketed to publishers, and, after thinking about it for awhile, I decided to go back in and rewrite it to fit the vision that I hadn’t originally been courageous enough to realize. 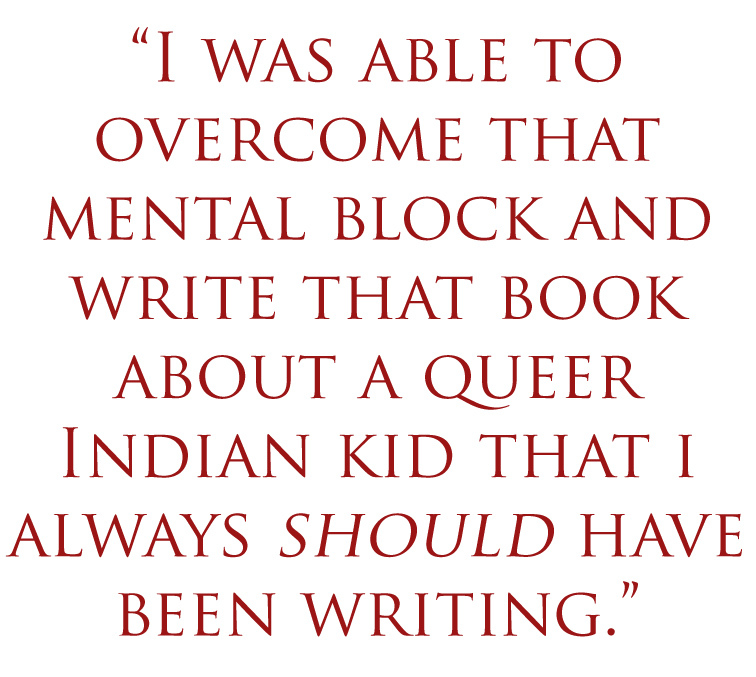 Because of this contest, my novel exists in a form that it wouldn’t have otherwise had: I was able to overcome that mental block and write that book about a queer Indian kid that I always should have been writing. I think that’s the benefit of having a publisher for books about and by people of color. It doesn’t only publish diverse and inclusive books…it also widens the entire marketplace. Just knowing that there is a potential home for books that explore all kinds of PoC experiences will do a lot to foster the writing of more and broader types of books. I’ve known about Tu Books since its Kickstarter campaign. I did get a little teary-eyed watching that video because a whole world had opened up for me. Not just for me as a writer, but for me as a reader, educator, and parent. I was probably one of Tu Books’ first contributors, having prematurely sent an unpolished manuscript. I’ve been at this writing thing for quite some time—submitting, revising, re-submitting—all while reading the online conversations around diversity in children’s books. There were some good discussions but they were just that—discussions. I was doing my part as a writer by working on my craft and submitting work. What were agents and editors on the other side of the gate doing to actually shift the dynamics and raise the number of books published for children of color? I would’ve been first in line sending my manuscript off by Owl Post Express the day the contest was announced, but I’d just gotten into an MFA program and was at the mercy of my adviser. I planned to work on my manuscript the whole semester and if she said that it needed work, I wasn’t applying. I’d made a commitment to really learn the craft and wouldn’t dare send out work that wasn’t ready (I’d done that too often). But she told me, “Get your application in yesterday!” And “yesterday” ended up being almost at the last minute on the heels of Hurricane Sandy. I’d agonized over whether a story about a Haitian girl was good enough, whether I should send one about a regular black American girl instead and not dig so deep into culture and mythology. It’s one thing to write fantasy as a person of color, it’s another thing to write as an immigrant and pull from your own culture to tell a story that can resonate with anyone. There are lots of us writing, and it would be such a disservice to children who are desperately in need of mirrors and windows to not provide resources for writers of color to hone their craft. Prizes, awards, grant money, scholarships—just about anything that would close the gap in some way. Yep, the New Visions Award is one step towards that, and SCBWI did something similar with their On-the-Verge Emerging Voices Award. Hopefully, with time, more avenues will open up. And yes, congratulations fellow Whos! I’m honored to be a finalist and in such great company. Ibi Zoboi’s short stories have been anthologized in The Caribbean Writer, Dark Matter 2, and Haiti Noir edited by Edwidge Danticat, among others. She’s received grants in Writing from the Brooklyn Arts Council and is studying Writing for Children & Young Adults at Vermont College of Fine Arts. She’s a mom of three, married to a visual artist, and teaches writing in New York City public schools. You can find her at www.ibizoboi.com. I came across Tu Books by chance, while going through the contest listings on the Poets & Writers website. The New Visions Award struck me because of how specific its guidelines were, and as a writer of color, I leapt at the opportunity to be part of something geared specifically towards children of color. I’m the Igbo and Tamil child of a Nigerian man and a Malaysian woman, and I grew up in Nigeria, straddling cultures like most mixed kids do, marked as ‘half-caste’ and essentially a foreigner in my home community. Finding places where I belong has always been important to me. Both my parents loved reading and made sure I had a constant supply of books as a child growing up in Aba. Most of these books were written by authors such as Enid Blyton and C.S. Lewis, and they all featured white children as the characters. Therefore, when I started writing books as a child (here’s one of them), all the people I created in my make believe worlds were also white and with Western names, even though I was born and raised in a deeply Igbo region of Nigeria. The books I’d read were the usual portal into other realities, which I ruthlessly applied to my childhood, convinced that pixies lived in the patch of grass in front of our house and that fairies filled my bedroom, entertained by my sister and I playing. It was easier to fit into these imaginary places. My love for speculative fiction developed from this, and the chance to develop a fantasy world for the New Visions Award was a perfect match for me. I actually wrote Somadina specifically for this award after I found out about it, penning down a few chapters to meet the submission deadline and drawing heavily from Igbo culture and history to craft a world that I would have liked a portal to myself. I wrote with young adults in mind and worried that perhaps some elements of the story would be a little too dark, but I kept reminding myself that the reality for many young adults of color is that they are likely to personally witness or experience the ‘dark’ themes that are present in my narrative. I had to stay true to the story and tell it the way it was insisting on being told. All in all, I’m deeply honoured to be a finalist with all these other amazing writers, and extremely grateful to Tu Books for its existence and for this opportunity. Akwaeke Zara Emezi is an Igbo and Tamil writer who was born and raised in the south of Nigeria. She started writing at five and in the succinct words of her seven year old self- “Her ambition is to be a world famous writer and artist. She has a family of 5 and loves art and books. Her hobby is writing.” Akwaeke now lives in Brooklyn and can be found online at www.azemezi.com. Previous PostMeet Our New Visions FinalistsNext PostBlack History Month: Why Remember Florence “Baby Flo” Mills? Here are the three finalists. Get to know us all.